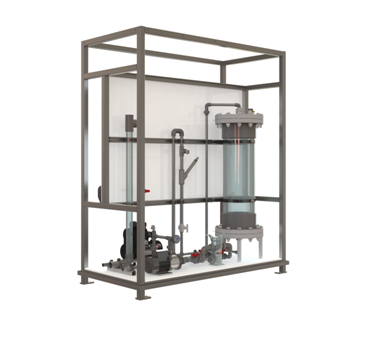 Module consists of a feed pump, basket strainer and a pressurized saturation tank. Constant feed flow is maintained through automatic PID flow control. The on-board air compressor can utilize ambient air for oxygenation. For higher oxygen concentrations, a standard 150 lb. compressed oxygen cylinder can be used in place of the air compressor. Dissolved oxygen can be measured in-line when A100 is used in combination with a PLC-based Intuitech pilot module.